Around 4:00 a.m. this morning, a transport truck carrying propane exploded in Toronto. Does this mean that Mayor Miller will issue another petition calling for an end to large propane explosions? 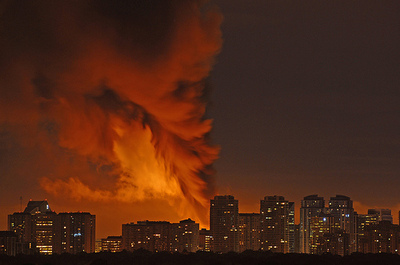 Huge explosion in Toronto. Already the finger-pointing and blame shifting has begun. 2) Harper allowed Bush to do it. 6) American guns did it. 8) General Motors, Ford and Chrysler did it. Too bad it didn't happen in Jane Finch. Totally uncalled for. What did the people who live there ever do to you? Propane is usually pretty safe. This is an unfortunate incident that's going to bring out a lot of crazy ideas about our energy strategy. The greens will use these photos over and over to promote wind and solar power. I heard Mayor Miller was away at the time. I'd say how typical this was of him, but then I realized that he's been so ineffective in office that his absence made no difference. In fact, this crisis will probably be better handled without him around. I disagree with Stig's comments about Jane-Finch. No one who matters cares one bit about that area. Instead, it would have been far better if this had happened in the rich white neighborhoods. As has been proven time and again, the only way to get anything done in Toronto is to attack the privileged. If you look close enough, you can see the shape of the devil in the first picture. I guess this spells the end for Toronto. We could do with a few less of them. We could do with a lot less of them. I suggest to ease urban crowding we encourage them to move out to Alberta. They won't move to Alberta because there is a culture of work in that province. In Toronto you pretty much have a right to not have to work, but continue to have a place to live and food to eat. It's called taking other people's money and giving it to lazy useless wastes of skin. AKA socialism. I have observed in my life, the most people tend to be unmotivated and lazy. That is why Socialism with it's fatal flaws continues to be so popular. Yes, it is very popular until it take hold. Then it morphs into a society of alcoholics, petty criminals and miserable wretches. We have lot's of evidence of that. Yet it is ignored by the control freaks who want to rule such a society. They are sick and we are stupid. Well not all of us, but not enough to turn the tide once it's begun. Some viciously ignorant comments here today. Raphael: Check out the comments site wide. You'll see that anytime you see Stig, H2 or Zebulon, you're going to see a whole lot of big government idiocy defended with a hammer. The Soviet Union fan club resides here. "Stig, H2 or Zebulon, you're going to see a whole lot of big government idiocy defended with a hammer. The Soviet Union fan club resides here." The Soviet Union was a criminal enterprise writ large and a morally bankrupt cesspool of failures. How's that for a fan? Where did you get the idea I defend big government? Examples would be nice. The comments do seem over the top, but I suppose this attitude's been brewing a long time. Just saw an update. A fireman has lost his life. I sure hope this wasn't arson, or worse. Not many big cities have facilities like this so close to residential areas. Sadly, a firefighter died while battling this inferno. Perhaps some of you will be hoping he lived near Jane/Finch or for Zeb, that he was a rich white Torontonian. The comments on this thread border on the disgusting. H2: Do you think the war on pot is making the government smaller? It, and it's useful idiots, are growing the government. If you're a fan of the drug war, you're a fan of growing the government. If you're a fan of Harper, you're a fan of growing the government 14%, so far. Right Malcolm: If you've ever been to Russia, as I have, and talked to the simple old "crush them with a hammer" Soviets, you have the philosophy of Stig, H2 and Zebulon. Other than them, this site can be very thoughtful. But, they do create traffic. The WS may be using them as Marx used his "useful idiots." "If you're a fan of the drug war, you're a fan of growing the government." Nice try. I've made no comments one way or the other so you can't call me a big gov't supporter because of that. You already decided so surely it was based on something I said previously. What was it? Show me where I support big gov't and don't make it retroactive based on future questions. "The WS may be using them as Marx used his "useful idiots." Somehow, I don't think LENIN (not Marx) included his enemies in that list of "useful idiots". H2: You are Marx/Lenin's best friend. You're just too simple to see that your policies reflect the reds. but you call yourself blue. I'll be giving you examples of your big government worshipping in the future. Sorry but I also find most of these comments sad. Granted that Toronto has a nut bar as a mayor and plenty of moonbats, but Toronto is no unique in that. I am also sure that some of the population are normal sane people trying to make a living. Why rejoice over events like this? Alain: When one takes pleasure in someone's misery, it is called Schaden Freude. Only losers solve prblems with a state hammer or embrace schaden freude. I don't need to mention the names of the three culprits. A prayer for all who died and those that survived them. That's where we disagree, JC. I think Zeb could go lower if he went into a coma. Wait a minute. You're right, that'd be an improvement. Great, Zeb just advocated what would be like a nuclear holocaust in Canada. He sounds like a terrorist to me. Send him to Gitmo. "Oh the humanity! A firefighter dies but the worst thing is that Toronto people will be slightly inconvenienced for a day or two! An extra 5-10 minute drive (or 3-4hrs on the TTC) on Monday. Time to call in the army, or the ultimate: file a petition!!! ZP, I can appreciate that you must have had a very unpleasant time in Toronto and thus Ontario, but to continue to carry such intense hatred is unhealthy. Hatred consumes the carrier and not the object. It does not mean that one did not suffer from wrongdoing nor that one condones the wrongdoing, but it is self defeating. Alain: Didn't Hitler begin as a common idiot full of hate? "You are Marx/Lenin's best friend. " Never met the dudes. Just how old do you think I am? "I'll be giving you examples of your big government worshipping in the future. " Ah, I see. Retroactive proof. Sounds like something Big Brother would do. Now who's worshipping the leviathan state? The last I checked I'm a private institution. But, you're right. I'll be watching. It's easier to let you prove yourself a state worshipper than it is for me to go check the H2 files for stupidity. I know more are coming. Sarcasm, in answer to your question I do not know. However I am not comparing ZP to Hitler. Nor did I wish to imply I am superior. I know from personal experience that my advice to ZP is true and hope it will be accepted in that light. Nothing more, nothing less. The commenter who calls himself "Zebulon Pike" has exposed himself as a vicious anti-white racist. Why hasn't the moderator of this blog deleted his hateful comment wishing this explosion happened in "the rich white neighbourhoods"? Or is it only comments hoping "we could do with a few less of them", presumably meaning non-whites, that get deleted? Pathetic. Or is it only comments hoping "we could do with a few less of them", presumably meaning non-whites, that get deleted? Pathetic. I completely agree. I had a comment removed in this thread that suggested that immigrants that didn't like Toronto could go home. The Punk also suggested in another thread that white people should be killed. That wasn't removed either. No, leave the anti-white stupidity on the blog. I'm white and I have the self-esteem to not worry about some idiot with a pen. I am not an 'anti-white racist' at all. I referred to the racial dimension in Toronto politics. Contrary to their denials, it does exist. Black needs and desires have been either ignored or delayed by city council. That's why Jane-Finch is in such shape, reminiscent of Detroit or Kingston, Jamaica. Meanwhile, whites receive a disproportionate amount of attention. I refer to the Jane Creba case. One pretty white teen gets gunned down, and all of a sudden it explodes into an international incident (I was in the UK when it happened, and it was headline news.) White Ontarians, I argue, receive better treatment from the hands of local, state and federal leaders than non-whites do. I admit that my statement "Instead, it would have been far better if this had happened in the rich white neighborhoods" was in poor taste. Worse, it was inaccurate. It appears the reaction by city officials and emergency workers was prompt and efficient, as it should be. Sorry. My point has been that Toronto has some very serious problems which are not being addressed. So long as white Toronto remains relatively unaffected, change will not come as quickly. All this multicultural stuff has not worked. Racial and ethnic barriers are as high as ever. I suggest you work on it. In the meantime, I will mock Toronto mercilessly. It's my thing. Oh come on Alain, he's like one of Pavlov's dogs, you just need to say: "Ontario" or "Toronto" and he barks. It's actually quite cute, in a disturbing kind of way. "It's easier to let you prove yourself a state worshipper than it is for me to go check the H2 files for stupidity." Leviathan State? Why, I did my undergrad there. "Go, Beasts, go!" Fine school, although I wouldn't necessarily worship it. But I meant to say that the firefighter here had a heart attack and died while inspecting the aftermath of this blaze, he wasn't killed in the course of fighting it. Still sad to lose him, of course, but let's be clear on the facts. Wow. My first time checking in here, while reading up on the explosions - plural - at a propane FACTORY - not a tanker truck - that was located, strangely, in a residential neighbourhood of Toronto; and see so many comments full of rage and hatred. I disagree that such hatred consumes only the carrier. Hatred also kills. Since one man may have died here (a missing employee of Sunrise Propane), along with the firefighter, who likely had a heart attack, and many other lives were threatened, and homes and businesses lost, it seems just amazing to be wishing theses losses on ANYONE. I hope the haters are just venting their spleens, but it doesn't always work that way. One thing has a habit of leading to another. Your blog, your policy of course, but I wouldn't allow such hatred a vehicle. "Your blog, your policy of course, but I wouldn't allow such hatred a vehicle." So, are you for or against the explosions? Your blog, your policy of course, but I wouldn't allow such hatred a vehicle. In the case of the commentators it is considered "Free Speech" on here. In the case of the article posters it is considered: "They're just kidding". As long as you aren't considered to be left of the debate you're welcome here.